‘He was defamed, slandered, his memory despoiled, and his martyrdom was continued, even by his own brothers in the priesthood and the episcopacy,’ Francis said, in unusually blunt remarks to a delegation from El Salvador visiting Rome. Romero was shot to death in 1980 while celebrating Mass, during a period of social revolt fueled by poverty and abuses of power. 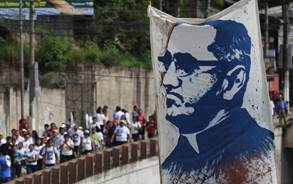 He was beatified in May 2015 in San Salvador, in one of the largest religious gatherings in the history of Central America. Romero’s death helped trigger a bloody civil war that went on from 1980 to 1992, with fighting between Communist guerrillas and a US-backed right-wing military government, reaching a death toll of more than 75,000 people. ‘How many times those who have given their lives continue being struck with the hardest stone there is: The tongue!’ the pope said, before leading the group in a prayer.